As discussed last time, the greatest era of Superman is generally considered to be the period after Mort Weisinger took the editorial reins of the character, circa the mid-1950s through the late 1960s (the Silver Age). Conversely, the character’s weakest period was likely the Julie Schwartz era, from the early 1970s to the mid-1980s (the Bronze Age). If you got your start reading comics in this later era (like me), then you already know that finding a good Superman story amongst all the flotsam was quite a chore back then. So I thought I’d follow up my previous blog post with a survey of the best Superman tales of this time, along with an analysis of why the majority of them were so weak. To begin, let me clarify that I do not mean to say that Schwartz was a bad editor. He was proficient with the revivals of The Flash, Green Lantern, etc. ; and did a great job with the Justice League and then Batman. But I don’t think he was ever the right fit for Superman. In fact, based on everything I’ve read about him, I’d bet that if he had been given complete freedom to do what he liked, he probably would have stuck to Mystery in Space with Adam Strange and/or other sci-fi anthology titles. The “science” part of sci-fi was usually emphasized strongly in Schwartz’s books. At times, this science could become overly intricate and complex. Even so, more often than not it worked well with The Flash and Green Lantern (and it fit perfectly with Adam Strange). With Superman, though, this became a dilemma. Because Superman is so very powerful, there’s no need to resort to such trickery as vibrating every molecule of his body, like The Flash, to break free of Gorilla Grodd’s death grip. Superman should be strong enough to break free through sheer strength. In fact, he should be able to beat most super villains with good old-fashioned muscle. Despite this, the Bronze Age Superman often eschewed using his super strength and would instead regularly use other powers in the most arcane, convoluted ways. When read today, this comes off like needless plot padding at best, or just plain ridiculous and/or stupid at worst. 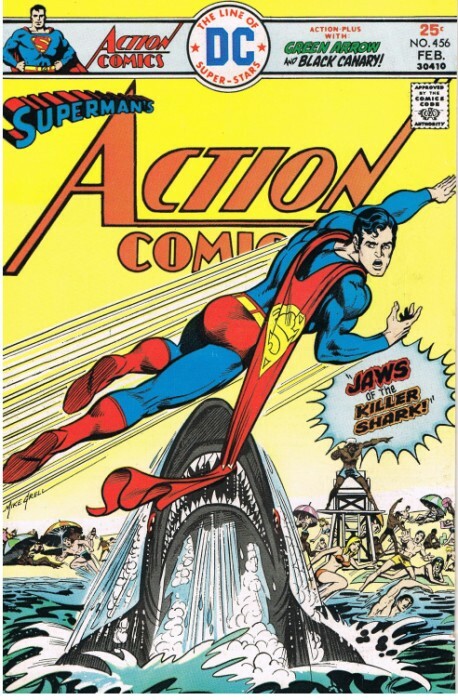 For example, Action Comics #456 (cover date Feb. 1976) was clearly designed to capitalize on the Jaws craze that the film sparked in the summer of ’75. Titled “Jaws of the Killer Shark,” the cover was even a straight up rip-off of the Jaws movie poster, with a huge shark bursting out of the ocean to take a bite out of Superman’s cape. 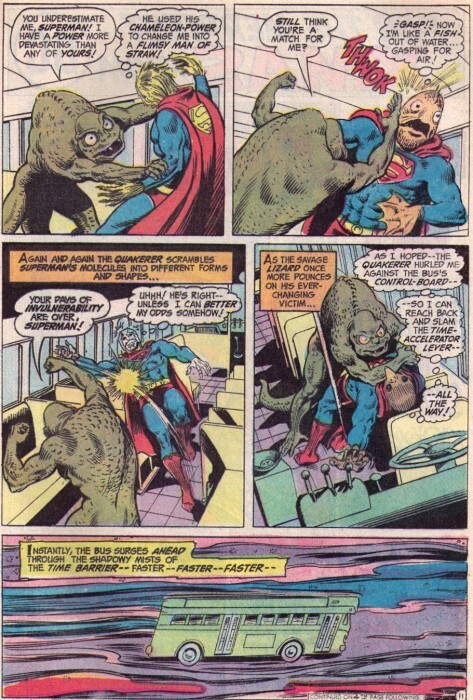 Written by Cary Bates and illustrated by Curt Swan, things get off to a strong start with Superman dramatically battling the Shark (who flies in a stream of water he controls telekinetically) in the air over Metropolis. As a kid that was all I needed. The rest of the story should be a lay-up, right? But then near the end, Superman figures out the only way to beat the Shark is to cut off his breathing supply. As a mutant creature, the Shark doesn’t extract oxygen from the water like a conventional fish; he extracts ozone, which Superman realizes because ozone is a blue gas and the Shark has this blue aura and…ugh! Enough with the science lesson, okay? I just want to see Superman punch a shark already! 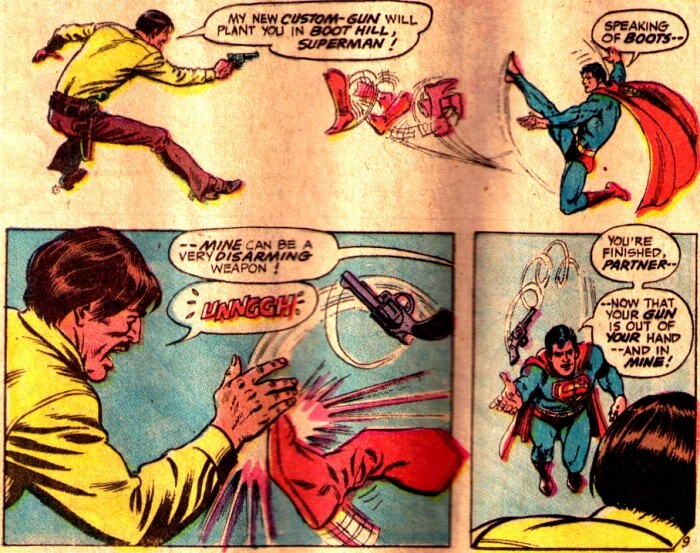 Here’s another one: In Action Comics #426, Terra-Man has guns drawn on Superman and Supes disarms him by kicking off one of his boots. With all the powers at his disposal, why would Superman do this? Couldn’t he have simply used his heat vision to destroy the weapons? Or better yet, punch Terra-Man in the face before he had a chance to pull the trigger? Speaking of Terra-Man, allow me to digress a moment: Terra-Man was probably the biggest addition to Superman’s rogues gallery in this era and, sadly, he’s a terribly executed character. If you’re unfamiliar with his backstory, Terra-Man was a boy born in the Old West who was taken from that era and raised by an alien being in another galaxy. Since he was taken away as a fairly young child, it’s logical to assume adult Terra-Man would be a largely alien character with just a touch of Old West affectation. Instead it’s the other way around: He’s a stereotypical cowboy with a whole lot of silly sci-fi trick guns, lariats, spurs, etc., plus the clichéd cowboy vocabulary. Terra-Man also rode a winged horse, evoking myth/fantasy much more than sci-fi—yet he was supposed to be a sci-fi character. It would have served him much better if he had a truly alien creature to serve as his steed. Another Schwartz specialty was the “gimmick” cover—one that would force the curious reader to buy the book in order to understand what the heck was happening on that crazy cover. Again, this was a good strategy for The Flash, Green Lantern, The Atom… But Superman sold on sheer name recognition; he really didn’t need any gimmick covers. So all the gimmick served to do was saddle Supes with weird plots made necessary by the many strange covers. Specifically, there were an inordinate number of covers emphasizing Clark Kent over Superman in this era. This was bad policy. Superman is the character pushing sales—not Clark Kent. Yet another problem during this time—and it pains me to say this—was Curt Swan. He was a terrific draftsman who could draw a beautiful line and whose anatomy was always perfect. This served the stories well in the Weisinger era, as Swan’s realistic rendering lent a sense of normalcy to some otherwise outlandish storylines. His work was so lovely, and so ubiquitous across the Superman line of titles, that most fans of the era would consider him the definitive Superman artist—a sentiment I share. But in all candor, his style could also feel stiff at times and was never very dynamic. By the ’70s his work paled in comparison to the electric house style over at Marvel, which was so heavily influenced by Jack Kirby. Swan also didn’t do alien creatures and tech very well. His space ships looked like flying saucers right out of a ’50s movie; his robots looked like they were guys in medieval plate armor; and his aliens tended to appear more cartoonish than scary. In a lot of ways, Swan was like the anti-Kirby. Unlike Swan, Jack Kirby’s anatomy was hardly realistic and his characters’ faces were rarely what you’d call pretty; but (also unlike Swan) his layouts were the most vibrant and energetic in the history of the medium and his design sense could be mind-blowing. Kirby always added something to the stories he drew and gave them a Kirby flavor. While he was an excellent artist, Swan almost never appeared to add anything to a story beyond what was already there in the writer’s script. I’m not arguing that Swan should have been pushed out in the ’70s. But I think all parties involved would have been better served if his assignments were tailored to stories that played to his strengths, like fantasy elements (stories of magical creatures or time-travel jaunts into the past), or were set more in the real world (stories of earthly criminals and such). For sci-fi flavored tales (battles with aliens and space-monsters, which made up the bulk of most Superman stories), I think it would have been wiser to utilize one of the younger, more vibrant artists who were at (or near) the beginnings of their careers. At that point in time, I’d say the best candidates available to DC would have been Neal Adams, Mike Grell, and José Luis García-López. While Adams and López did do a handful of Superman assignments, and Grell worked regularly with Superboy on the Legion book, it wasn’t nearly enough. The writing wasn’t the greatest, either. Most of the workload fell on newcomers Cary Bates and Elliot S. Maggin, who weren’t terrible writers, but they weren’t capturing the imagination of comics readers like their young counterparts over at Marvel (Steve Gerber, Steve Englehart, and Don McGregor spring to mind here). In all fairness to them, as young writers working on an iconic franchise character like Superman, I’m guessing they weren’t allowed to be too daring or get too experimental with their storylines. It follows that relative “kids” like them would also be more vulnerable to the worst influences of comics veteran Schwartz, as outlined above. With the migration of several “name” Marvel writers to DC at the dawn of the following decade, there was some (at least marginal) improvement. The work of Marv Wolfman and Gerry Conway in Action Comics beginning in late 1980 saw the title transition away from impenetrable science to more Marvel-style action—a change the book sorely needed. But even though the stories were better than before, there was still no consistent greatness for Superman during this time. The Bronze Age remained a spotty period for the Man of Steel, and you had to savor those rare moments of glory when you found them. I look forward to sharing some of my favorites of these moments…next time around.